An update to the status of our grant application process. 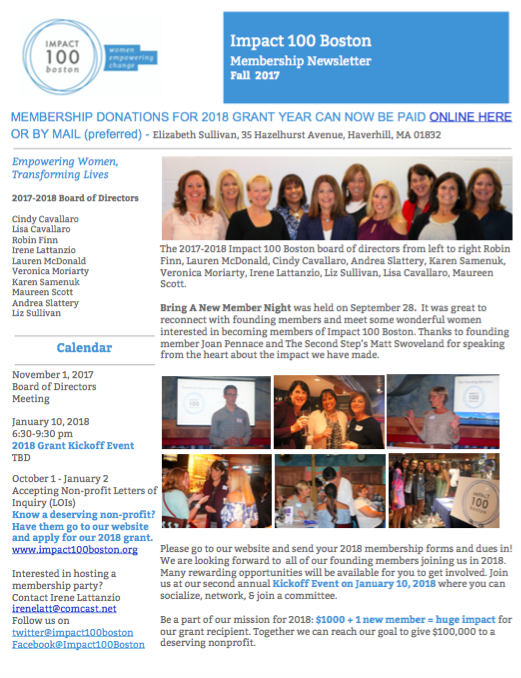 Click here to read the Impact 100 Boston Fall 2017 Updates Newsletter. 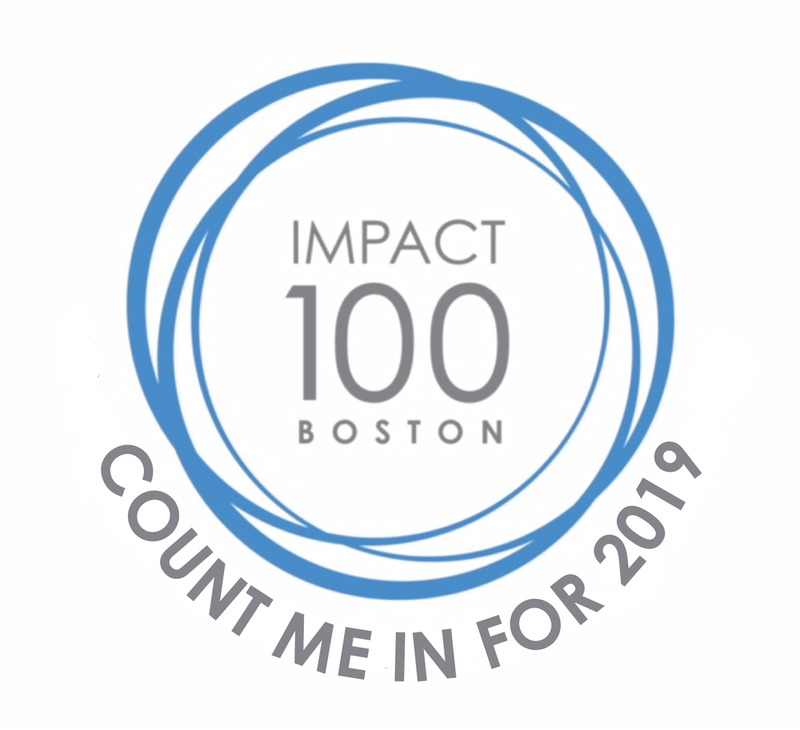 Click here to read the Impact 100 Boston Summer 2017 Updates Newsletter. 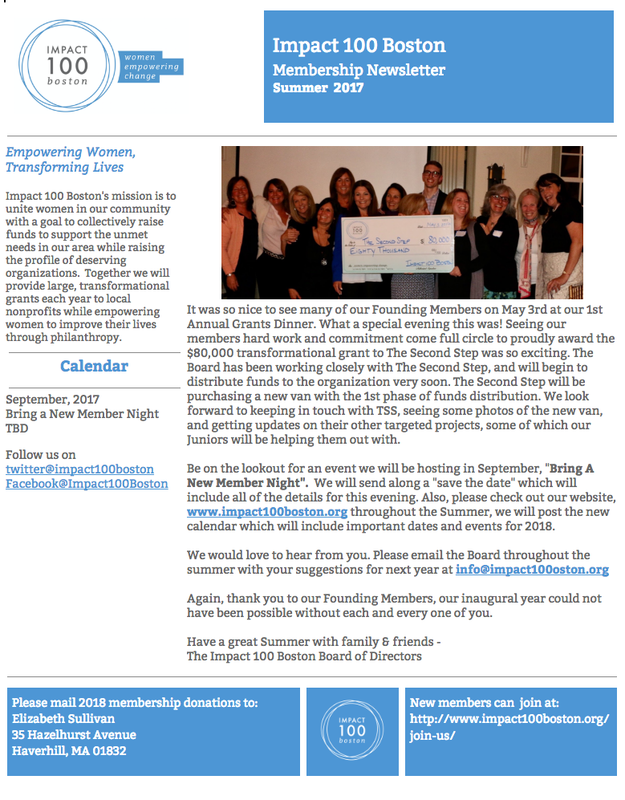 Click here read the Impact 100 Boston Summer 2017 Newsletter. This way we can get this Jacki into the hospitals for all the women enduring a mastectomy. The code reimburses at $58.21 and we are in the process of figuring out all our new additional costs to the garment. We designed the “new” improved Jacki and sent the prototype to our manufacturer in China for samples and costs. Next we have to do a one-sheet for the “L” code application (see attached). We hired Cathy Fox, the reimbursement specialist, to streamline the application process. We will keep you posted as we make further progress. Your funds are helping us achieve the reimbursement status and our ultimate goal to help all who need the Jacki, without financial burden. Thank you so much! Your grant is having a huge impact on both helping the patients now, and future patients as well. Impact 100 Boston awards The Second Step first annual transformational grant.